This is normally abbreviated to BCC and is actually the most common cancer that humans develop. Thankfully, it is rarely fatal and if detected early and dealt with properly, is usually curable. What Causes Basal Cell Carcinomas to Develop? Excessive exposure to ultraviolet radiation (sun burns) is the main cause of basal cell carcinoma. People with fair skin and blue eyes are more prone to developing basal cell carcinomas because they have less ability to tan and thus less resistance to ultraviolet (UV) radiation. 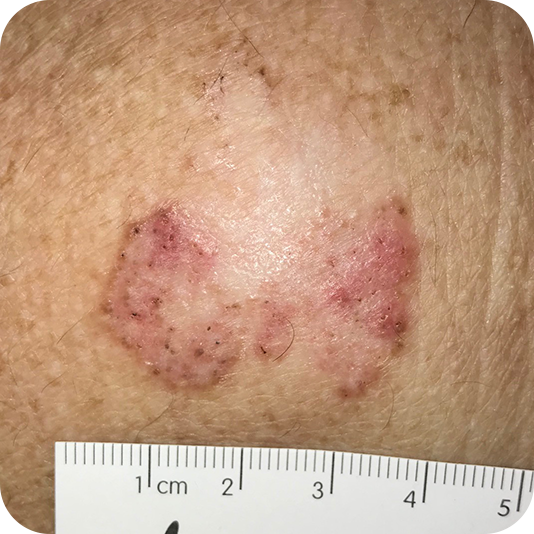 Intermittent severe burns (common among tourists from colder climates visiting warmer climates) rather than daily exposure to UV (as in the case of farmers) result in a higher risk of getting basal cell carcinomas. There are several rare genetic conditions which also predispose people to basal cell carcinomas but these are so uncommon that they will not be discussed here. How do Basal Cell Carcinomas Develop? Ultraviolet light from the sun penetrates into the skin and energises oxygen molecules within the cells of the epidermis. These energised oxygen molecules (oxygen free radicals) have the ability to damage the DNA in cells. If enough damage is done to sensitive parts of the DNA of skin cells, this may trigger one (or several) of those cells to turn cancerous. The cells at the bottom (basal) layer of the epidermis are known as the basal cells. If one of these cells turns cancerous, multiplying to form a tumour, the growth is known as a basal cell carcinoma. Do Basal Cell Carcinomas Spread? 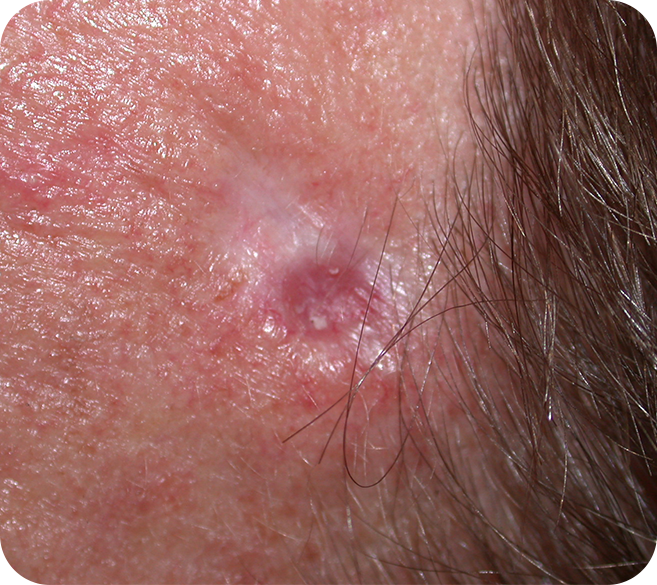 Once a basal cell carcinoma has formed, the cells within it continue to multiply. Fortunately, basal cell carcinomas do not have the ability to metastasise (spread) via the bloodstream or the lymphatics and as a result cannot spread to organs within the body or to one's lymph glands. Instead, basal cell carcinomas invade locally. They grow into the skin where they have arisen and slowly destroy the tissues beneath them and around their edges. This often results in the formation of a sore that bleeds easily and has the appearance of having been gnawed away by a rat. This gives rise to the colloquial term of "rodent ulcer". Of interest is that basal cell carcinomas rarely produce any pain even when a sore has developed. If Basal Cell Carcinomas Do Not Spread, are They a Problem? Basal cell carcinomas become problematic when they start destroying sensitive tissues such as one's eyelids or nose, or where they invade deeply and start growing into underlying muscle and bone. Some basal cell carcinomas have the ability to invade nerve fibres and then spread along these fibres. If neglected for years, basal cell carcinomas may ultimately follow nerve fibres all the way into the spinal cord or brain. This is fortunately very rare. One of the common problems with BCCs is that they bleed and weep, and this (plus all the extra laundry) is what commonly prompts people to seek help. Are There Different Types of Basal Cell Carcinomas? There are several types of BCC which are named according to their appearance. 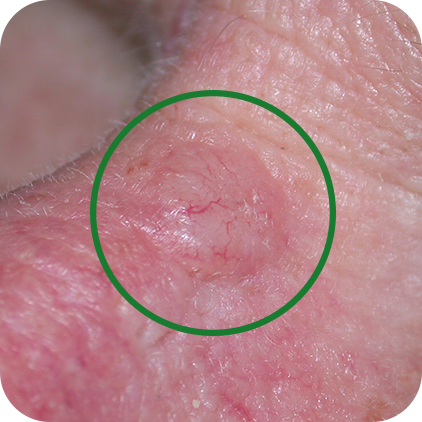 All the different types of BCC have much the same pattern of growth except for morphoeic BCC, which looks like a scar in the skin (it got its name from the Greek word for scar which is morphoea). It has a deceptively benign, normal appearance and thus tends to be diagnosed at a later stage. It is, the most invasive type of BCC and, unlike the other types of BCC, has the ability to track under the surface of the skin. This means that morphoeic BCCs are often much larger than they appear to be on the surface. This has implications when planning treatments (we will usually do a frozen section in theatre: see below). How are Basal Cell Carcinomas Diagnosed? 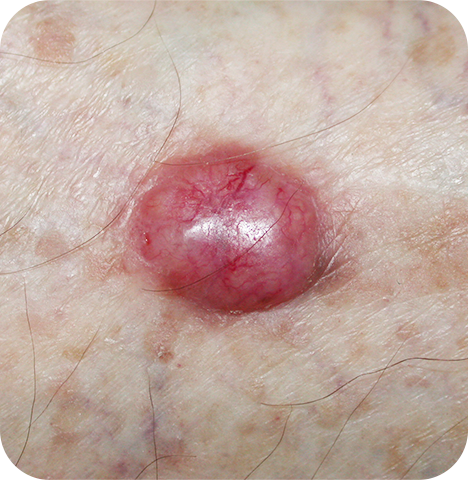 Most basal cell carcinomas have very specific appearances and can be easily diagnosed just by looking at them. Where there is uncertainty, the use of a skin microscope (dermatoscope) usually aids diagnosis. If there is still uncertainty, then it becomes necessary to do a biopsy. A small piece of the lesion is removed after numbing the area with local anaesthetic and is sent to the pathology laboratory for testing. How are Basal Cell Carcinomas Treated? The most definitive form of treatment, which has the highest cure rate, is to do a surgical excision. A safety margin of normal looking skin needs to be included around the BCC just to make sure that one is completely clear of any microscopic extensions (roots) that have spread a bit further. 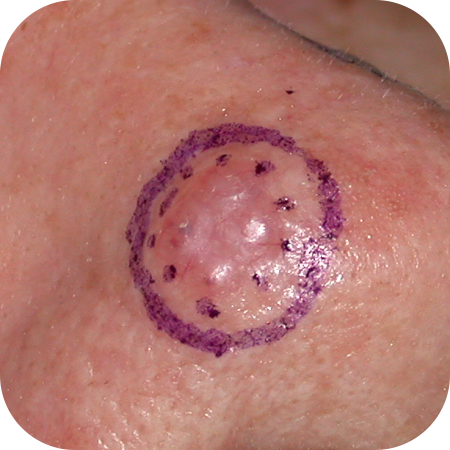 In cosmetically and functionally sensitive areas, such as the nose or eyelids, or when treating recurrent (BCCs that have been excised before but have regrown), morphoeic or very large basal cell carcinomas, it is prudent to use a technique called a frozen section (also known as Mohs surgery) to increase one's ability to ensure complete removal of the BCC. How is a Frozen Section (Mohs Surgery) Done? To do a frozen section, it is necessary for the pathologist to come into theatre. The BCC is removed by the surgeon and carefully labelled so that the pathologist knows which way it is orientated (the numbers of a clock face are used and the specimen is usually marked with a stitch at 12 o'clock). The pathologist takes the specimen to a lab within the theatre complex where the sample is then frozen (using dry ice) within a special resin. This results in a solid block, which makes it possible for the pathologist to cut the specimen into very thin (3 microns thick) slices that can then be stained and looked at under a microscope. The pathologist checks the underside and all the edges of the specimen to make sure that there is no sign of any BCC. If BCC is found on an edge, the pathologist then informs the surgeon of exactly which edge and the surgeon then removes more tissue from this area. This is then tested further by the pathologist. One continues excising and testing until one is confident that one is clear of all the BCC. Another name for this technique is Mohs micrographic surgery, named after Dr Mohs who first developed his technique in 1938. 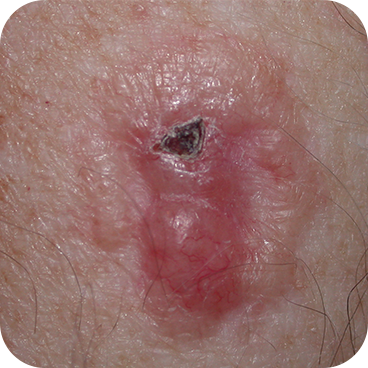 Smaller basal cell carcinomas can be treated by curettage. This is commonly performed by dermatologists who use a sharp curette (like an ice cream scoop) to scrape the BCC off the skin's surface. This leaves a raw area which is cauterised and left to heal by itself with the help of a daily antiseptic dressing. Curettage is usually a very definitive treatment for early BCCs and one of the benefits is that one has a specimen that can be sent to the path lab to confirm the diagnosis and to determine whether or not the whole BCC has been removed. If a BCC is very superficial (i.e. 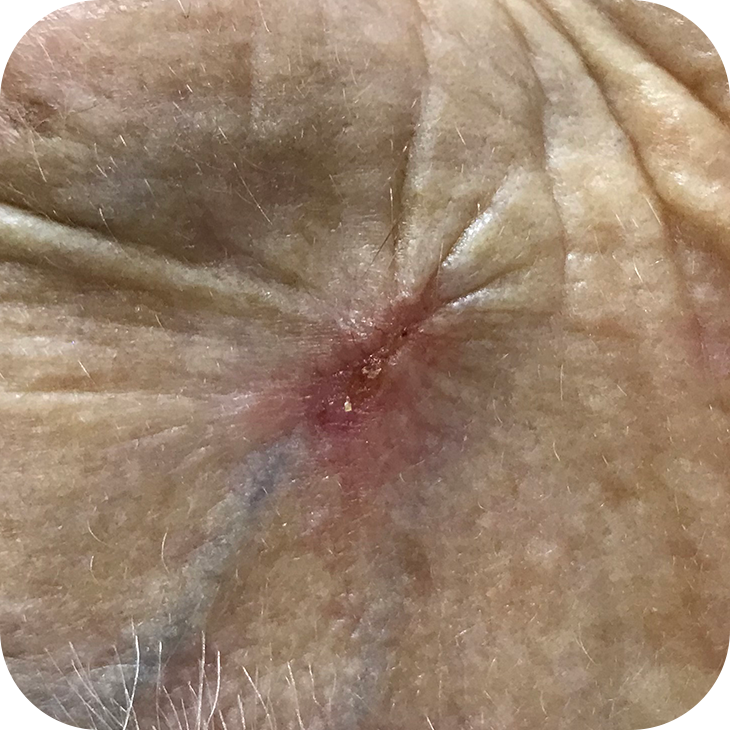 confined to the epidermis or very superficial dermis) and does not appear clinically, or is proven on biopsy not to have invaded into the skin, then it is possible to treat it with Aldara cream. The active ingredient of Aldara is Imiquimod, which stimulates one's immune system to attack the BCC. The recommended treatment period is for 6 weeks, applying once a day in the evening, 5 times a week (usually Monday to Friday). The Aldara cream is then washed off in the morning and normal make-up or sunscreen can be applied during the day. 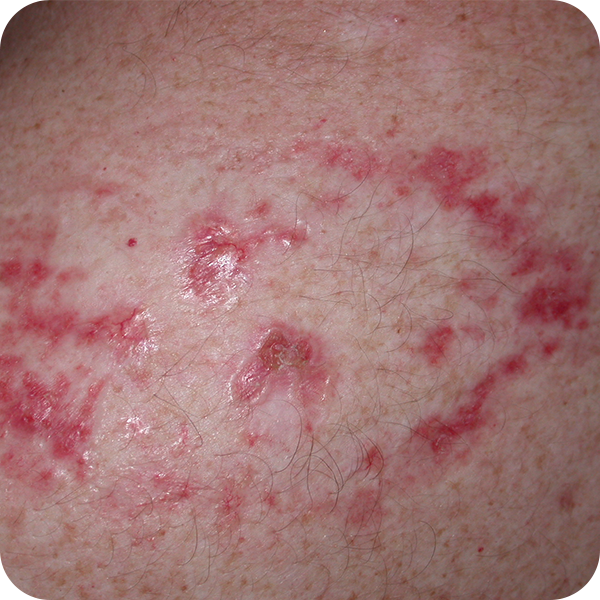 During treatment, the BCC becomes red and inflamed and a scab develops. The scab can start to weep or bleed and if this occurs before the end of the official 6 week treatment period then one can stop using the Aldara. 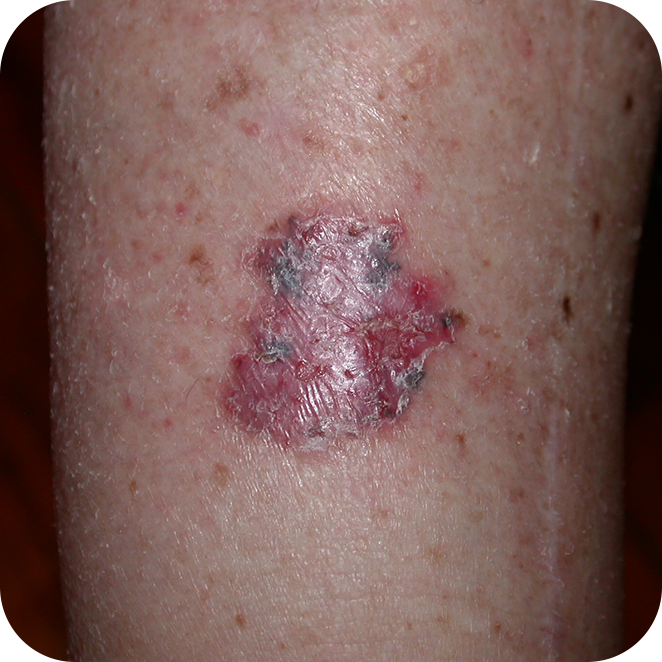 The scab usually falls off 1-2 weeks after treatment ceases. Aldara is an effective treatment for most superficial BCCs but sometimes the treatment is not fully effective and a small amount of BCC remains. It is only possible to see this once all the inflammation has settled so it is always a good idea to have a check-up three to four months after the completion of the Aldara treatment just to make sure that there is no persistent BCC. Aldara cream is packaged in sachets the size of large postage stamps. To get the cream out of the sachet, it is necessary to prick a small hole in the corner of the sachet (using a pin) and then squeeze out a small amount of the cream. This is normally applied using one's finger. The Aldara needs to be gently rubbed into the BCC and for about 5mm around the edges of the BCC. It is necessary to wash one's hands after application and then to avoid touching the BCC. Aldara must not get into one's eyes because it stings. The hole in the sachet is sealed using the pin. 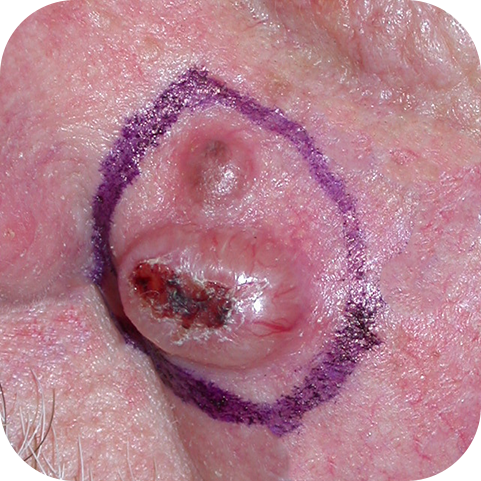 Efudix cream was initially used for the treatment of in-situ squamous carcinoma (a very superficial form of squamous carcinoma confined to the epidermis, also called a Bowen's patch after the doctor who first described it) of the skin, but is also used for treating solar keratoses and superficial BCCs. The active ingredient in Efudix cream is 5-fluorouracil which is also used intravenously for treating colon, breast and pancreatic cancer. Efudix kills pre-cancerous and cancerous cells while having little effect on normal cells. Once applied to the surface of the skin, it gets absorbed into the epidermis and is only incorporated into the DNA of cells that are actively dividing. Actively-dividing cells that have incorporated Efudix into their DNA die in the process of replicating. Normal cells divide relatively infrequently while pre-cancerous and cancerous cells divide at a much more rapid rate, so these cells are much more affected by Efudix than normal cells. Efudix needs to be applied twice daily for three to four weeks, although it may be necessary to treat areas such as the back of the hands for up to eight weeks. 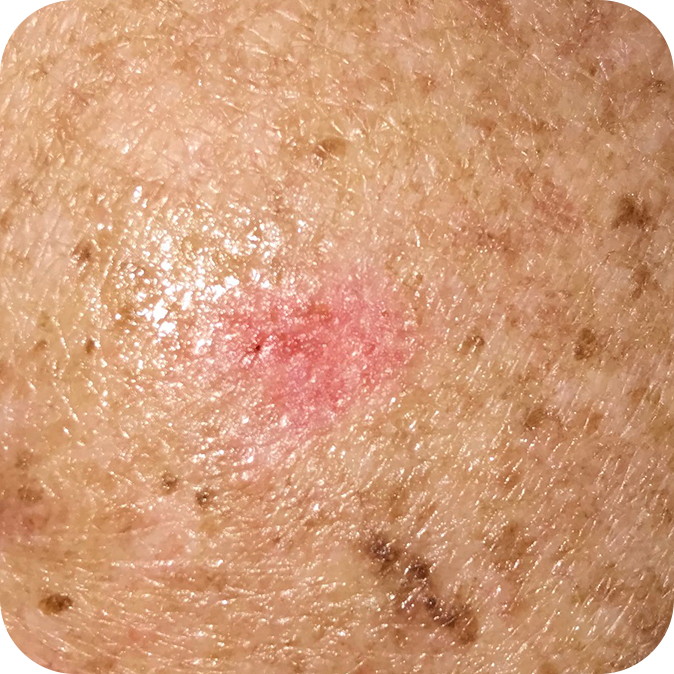 During the treatment, sun spots and early skin cancers will become more and more inflamed until they start to form scabs. The end point of treatment is when the scabs start to become weepy. Occasionally, some people get a much quicker reaction and weepy scabs form after just one week. Once this stage has been reached, treatment can be stopped. It usually takes about two weeks for all the scabs to dry up and fall off after the treatment is stopped. Very rarely, people are allergic to Efudix and get a severe reaction with significant swelling occurring within a day or two of starting treatment. If this happens, the Efudix must be stopped immediately. 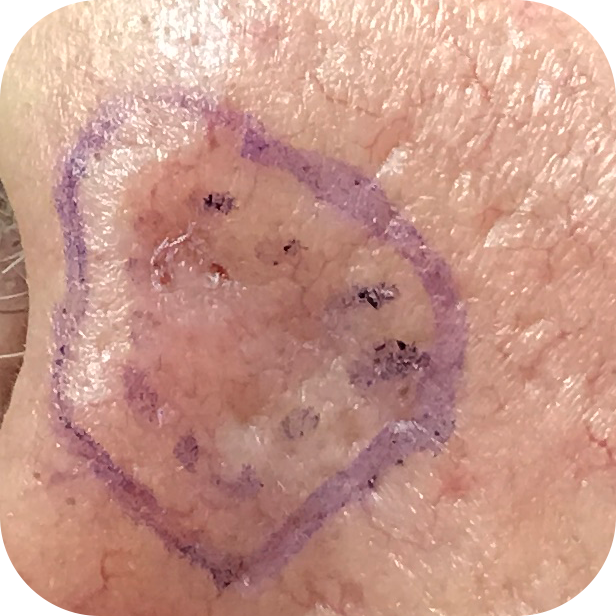 Photodynamic therapy is primarily used for treating sun spots (actinic/solar keratoses) but can be used for treating superficial BCCs. PDT is not appropriate for treating invasive BCCs that have spread into the dermis of the skin because it cannot penetrate deeply enough. If one treats invasive BCCs with PDT, the most superficial parts of the BCC will be killed and for a while, it may appear to have been cured, but the deeper cancer cells will continue to multiply and after several months, a larger BCC will re-appear on the surface. Photodynamic therapy uses a chemical (5-aminolaevulinic acid), which is applied to the surface of the skin. The chemical is absorbed into the cells of the epidermis (and a little into the dermis) and is more concentrated into abnormal areas of skin where there are superficial BCCs and sun spots. When this chemical is exposed to sunlight, it is activated to produce singlet oxygen within the epidermal cells. Singlet oxygen is a very unstable form of oxygen that damages the epidermal cells irreparably and they die. The problem with PDT is that the treatment is quite painful. The benefit is that it is quick and when used in the correct circumstances can cure early BCCs and sun spots, improving the cosmetic appearance of the skin. 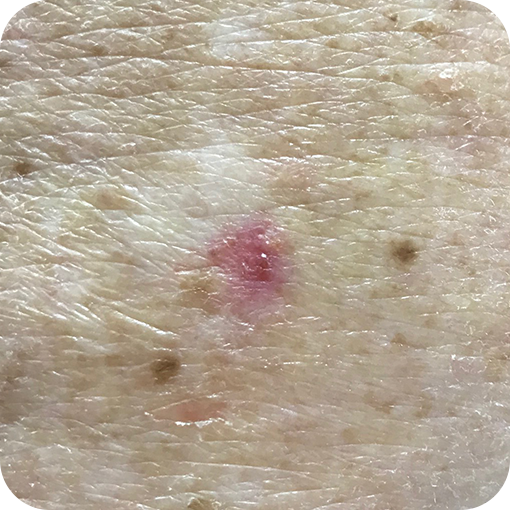 Liquid nitrogen is primarily used to treat sun spots (actinic/solar keratoses) but can be used to treat very early BCCs (but this is generally not recommended). 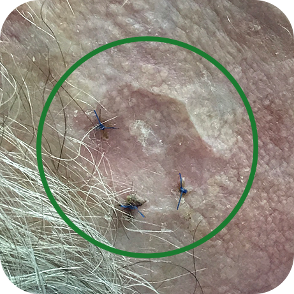 When liquid nitrogen is sprayed onto a solar keratosis or early BCC, the temperature of the skin at that site will drop to between -25'C and -50'C depending on how long one does the application. A burning sensation (well tolerated by most people) occurs at the time of the freezing and this disappears quickly as the frozen area thaws. The surface cells that are frozen die as they thaw, which results in the death of the keratosis or early BCC. It is not uncommon for a blister to form in the first few hours after the freezing. It is best to try and avoid popping the blister and one can apply a small plaster to protect it. If a blister forms, it usually dries up within a few days to form a scab. The dead epidermal cells under the scab are slowly replaced by healthy cells which grow in from around the edges. 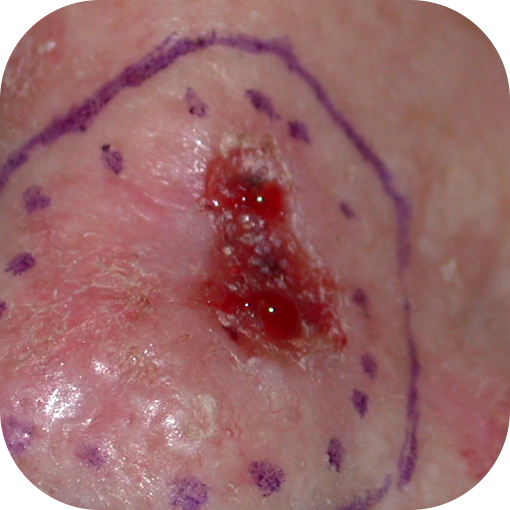 Once the area has been completely healed by new healthy cells, the scab will fall off. It usually takes between two and three weeks for the scab to fall off but can take up to six weeks on the shins.